Vita: a biography or resume + iridescent: showing luminous colors that seem to change when seen from different angles. This is my colorful journey in Seoul, South Korea. This past weekend, the weekend before my midterms, my friends and I took a trip to Ilsan (일산), a large area in Goyang, Gyeonggi-do (경기도 고양시 ), which is just northwest of Seoul. (A little fun fact for you, Goyang and Maui (my hometown) are actually sister cities since this past February!) We visited the Ilsan Lake Park (일산호수공원) which is the largest manmade lake in Asia. For the month of October, the park has a special event every weekend night at the Musical Fountain (노래하는 분수대). These events happen during other months as well so check the links I provided (both in Korean) for more information. Although I have only seen a handful of sights/sites in Korea, I can already tell that the 노래하는 분수대 is going to be one of my favorites! Though it was a lot chilly, just being out in the fresh air watching a spectacular show was just so refreshing. Definitely needed a break from all the studying and city life I've grow accustomed to. At the entrance, there was another event/festival going on. MBC building close to the park! I definitely want to go visit the park again before I have to go back to Hawai'i. A very good place to go on a date with a significant other or a picnic + bike ride day with friends. When I visit again during the day, I'll post more photos of the rest of the park! 추석 (Chuseok) is Korea's version of Thanksgiving (also known as 한가위) and is the biggest celebrated holiday in Korea. As with American Thanksgiving, people from all over the nation go back to their hometowns or wherever their family decides to celebrate the holidays. It is a time to commemorate your ancestors as well as celebrate good harvest in the autumn season. Traditional customs include eating 송편 (songpyeon) and playing games such as 씨름 (Korean wrestling) and 강강술래 (ganggangsullae [video]). As this is a family centered holiday, a large number of shops and restaurants will be closed. If you're a foreigner in Korea, even if you're alone, fret not! There's still quite a number of things to do. Most of the touristy places will be open during the holidays to accomodate the large number of foreigners here. 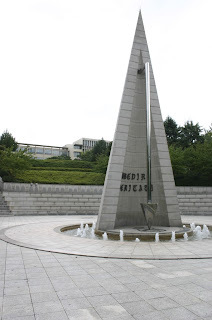 Here is a link of this year's holiday schedules and hours of various places around Seoul. Some of the more popular things to do during 추석 is visit various museums and palaces across Seoul. Or even go to the large amusement parks such as Lotte World or Everland. A lot of these places offer special discounts and events for foreigners. My friends and I went to Everland and it was packed with people from all over the world! And it was also the actual day of 추석 so they had a special Moonlight Parade which was a fun and amazing sight to see! But if you don't to be surrounded by a lot of people, you could also decided to go on a hike and experience the more calm, serene part of Seoul. It'll be less crowded than normal and going with few friends can make the trip a great experience! Here's a link to some of the best places to hike in Seoul. Since 추석 is a three day holiday, you could also decide to travel to a different country or to a different part of Korea such as 부산 (Busan) or 제주 (Jeju) but I would schedule these trips and purchase (plane and/or train) tickets in advance as sometimes they run out. Also, if you're traveling abroad, make sure you're able to get back into Korea with the proper documents (passport, visa, ARC, etc.). Sorry it's been a while since my last update. I've been busy with school and watching old episodes of 런링맨 (Running Man) on my free time. I've been living in Korea for more than a month now and I've gotten quite used to it. The weather is just starting to get colder and I love it! Again, from the outer stage but you can still see how great the seats were. I had a lot of fun and I'm definitely looking forward to my next one. I wasn't without worry however. I've heard stories of people arriving at the break of dawn to see their favorite artists live so I made sure to research exactly what it is I had to do for these concerts. And with that, I have a fews tips on how to survive your first K-Pop concert! I've officially been living in Korea for about two weeks now and I'm already getting quite familiar with my surroundings. 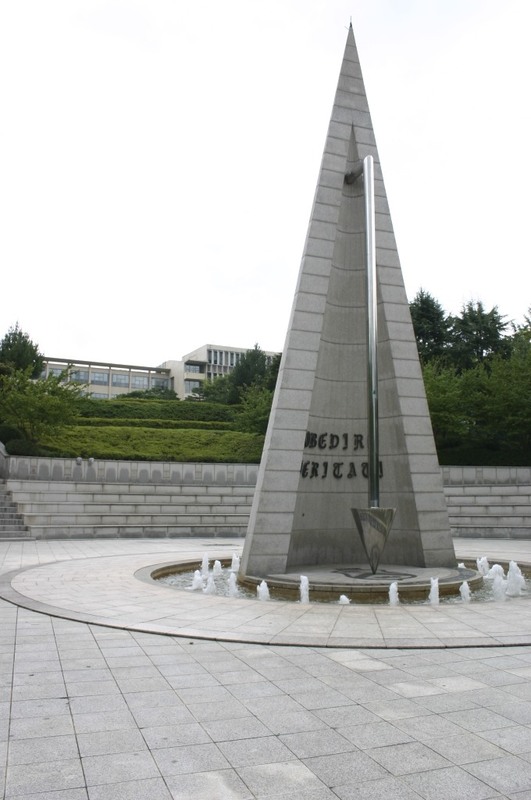 Sogang University is located in the Mapo district (마포구) of Seoul. It is conveniently located literally right next to the Seodaemun district (서대문구) which is home to Sinchon (신촌동), a largely populated neighborhood because of it's active nightlife and close proximity to other universities including Yonsei University (연세대학교) and Ewha Woman's University (이화여자대학교), two other universities affiliated with my school's student exchange program. There are a lot department stores, restaurants, and convenience stores located near by so getting what you need doesn't require a lot more than proper research of transportation to and from (more on than next time, I suppose). I haven't actually had the chance to take too many pictures of my school but there's actually not much to take pictures of anyway. haha! It's a fairly small school compared to the other universities I've visited here. My classes are in only two buildings, both of which are a five to ten minute walk from my dorm. I only have three classes and they're all on Tuesdays and Thursdays, so I've got five days out of the week to explore the rest of Seoul, run errands, and complete my homework of course. No wants to be without money, right? Especially when in a foreign country. No one can be completely worry free when it comes to financial issues but here are some of my experiences and tips (in bold) to be somewhat worry free while abroad. It's my first time being abroad since I first moved from the Philippines to the US but even then, I was but five years old so I knew nothing about traveling; and a lot has changed since then too. Of course I took the time to study up on all the right and wrong ways to travel but like I said earlier, you can never be completely worry free. I arrived in Korea with ₩246,000 (South Korean Won) (roughly $250 including fees). The recommended amount to arrive at your destination with is $300 of the local currency (about a weeks worth of expenses if distributed properly), at least until you can open up a bank account. My friends had planned ahead earlier than me and had exchanged their money via banks or travel agencies, all of which could take a week or so depending on your location. I exchanged my money at a Foreign Exchange station at the airport in Hawai'i because I didn't have enough time to wait for the bank. The exchange rate and fees were okay, but I'd definitely research and consider other options because airports tend to be a bit more expensive. Roughly ₩126,000 went to a seven-night stay (₩18,000 or ~$15 per night) at a hostel in 홍대앞 (Hongdae) called Kimchi Hostel. (My school's dormitories weren't open for another week.) For transportation, about ₩20,000 went to my T-Money card (more on that another time). And the rest I distributed to food for the duration of my stay in the hostel. I also received ₩100,000 from my friend's mom (whom I give so much thanks to!!) because she worried about me being financial unstable at the time. Even though I had moved into the dorms after my stay in Kimchi, I still couldn't open a bank account until the following Monday when school started because the banks in Korea are closed on the weekends. And also because my other friend was going to help me with the process. When opening a bank account, I definitely recommend making friends with and bringing a native speaker because even if the teller knows English, it's very limited and there could be important information that you need to know about your account, fees, etc. I opened a bank account under 우리은행 (Woori Bank) because they have a lot of Global ATMs throughout Seoul, they do online banking, and they have an English website, though I've never really used it. This is where most of my financial problems really struck home. I really needed to quickly get my money wire transferred as soon as possible because the deadline for dormitory fees was fast approaching (Mon, Sept. 03). Even though Woori had online banking available, I couldn't use it on any computer I tried. I asked the teller if it was possible for them to do it for me but they said it had to be done through my own account from Hawai'i. The problem was that the online wire transfer system my bank uses is only for the US and the only other way to transfer money is to apply in person. Obviously I can't do that since I'm already here, right? So I was scrambling for other ways to get my money here on time. Remember those Global ATMs I said my bank had? As a last resort, I've been using them to get my money here as quickly as possible. They do have a max limit of ₩1,000,000 (~$880) per transaction and depending on your bank back home, they will have extra fees and might also have a limit of transactions per day. For my bank, they have an international service charge of $17 and an ATM withdrawal fee of $5. Not too bad for a single transaction but I've already made four because of transaction limits and that definitely adds up. However, I do need to pay my school fees tomorrow so I can live with live without a hundred dollars or so. Woori is not the only bank in Korea that does international services. 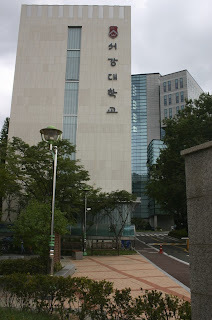 Korea Exchange Bank (KEB), 신한은행 (Shinhan Bank), Citibank, and 하나은행 (Hana Bank) are some of the other popular banks in Korea. Each have their own fees, account types, and what have you so either spend some time researching their respective websites or just go with the bank available on your campus. As a side note, different banks may allow you to deposit foreign (personal?) checks for a fee but it will take about a month or so to get into your account. The fee is most likely less than having stacked withdrawal fees but you do what you must. With just a little more than a week left before I head off to Korea, I recently received my visa in the mail. I submitted the application to the Korean Consulate General (KCG) on O'ahu on August 02 and received it today, August 07. Thankfully, it only took two to three days to process and a little less than a week to return to me (over the weekend and with express mail).